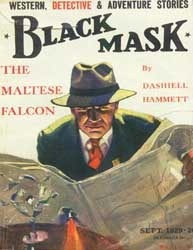 The Maltese Falcon is a 1930 detective novel by Dashiell Hammett, originally serialized in the magazine "Black Mask". The story has been adapted several times for the cinema. 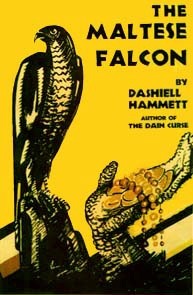 The main character, Sam Spade, appears only in this novel and in three lesser known short stories, yet is widely cited as the crystallizing figure in the development of the hard-boiled private detective genre – Raymond Chandler's character Philip Marlowe, for instance, was strongly influenced by Hammett's Spade. Spade was a departure from Hammett's nameless and less than glamorous detective, The Continental Op. Sam Spade combined several features of previous detectives, most notably his cold detachment, keen eye for detail, and unflinching determination to achieve his own justice. He is the man who has seen the wretched, the corrupt, the tawdry side of life but still retains his "tarnished idealism". Some people were surprised when The Maltese Falcon, a detective novel, appeared on The Big Read list. Yes, it is a detective novel—one of the best ever written. It’s also a brilliant literary work, as well as a thriller, a love story, and a dark, dry comedy. The only criticism one could offer Hammett’s private-eye classic is that it is so much fun to read, it might be hard the first time through to realize how deeply observed and morally serious it is.